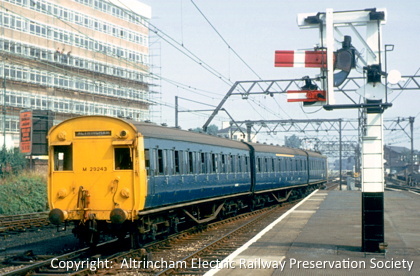 The Society, also known as AERPS, was formed in 1970 to save some of the MSJ&AR 1931 Altrincham Electric multiple units. It is a focus for local railway interest. AERPS presents, monthly from October to April, a series of lectures on railway and related topics. Open to both members and visitors, they are held at the Altrincham Methodist Church Hall. From time to time visits to places of railway interest are arranged; details are on the Excursions page. Members receive the Society’s journal Live Wires, free admission to the Winter Lecture Series and the opportunity to take part in all AERPS activities. Further information on the Membership page. Live Wires 130 was sent to members in March 2019. The May 2016 issue 122 web version, can be downloaded as a sample copy; its file size is 214 KB. The MSJ&AR 1931 electric multiple units were replaced by the 1959 designed (AM4, later known as class 304) 25kV AC units in May 1971. The AC units had been introduced from 1960 onwards with the main line electrification scheme. A few months after their withdrawal, two centre trailer coaches were purchased by the AERPS for preservation. They were moved to the Yorkshire Dales Railway (now Embsay & Bolton Abbey Railway) at Embsay near Skipton. In 1983 the coaches were transferred to the Midland Railway Centre (now Midland Railway-Butterley) at Butterley in Derbyshire. See the Coaches page for more information. The partially restored coach is undergoing further work. The other coach MSJ&AR No. 121 [BR M29670M], showing almost all of its timber frame, can be seen in the large Matthew Kirtley Museum building at Midland Railway-Butterley. The Society, which is a focus for local railway interest, has taken steps to preserve artefacts and records. These include books, photographs, drawings, signs and signals which it is hoped will one day form the nucleus of a museum display. Some members also take an interest in the history of the line and this has included writing books and photographing the line. Listed building status was obtained for Brooklands and Deansgate stations. They join a third, Oxford Road, which has the distinction of being the first post WWII building to be awarded such recognition. During 1999 the Society took a leading role in the MSJ&AR 150 celebrations publishing a booklet and unveiling a plaque at Altrincham Station. The 75th anniversary of electrification was marked in 2006. The Society is also a member of the Heritage Railway Association. Facebook users can follow the Society at this link. Links to other selected local information and railway related sites.